If the Windows desktop does not take up the entire display, or if the screen is at too low a resolution (icons on your screen are very large), the problem may be an incorrect video driver. • If the screen resolution is too low (or too high) first try selecting a new resolution. In the Start menu select Settings > Control Panel. In Control Panel select the Display utility. In the Display utility, select the Settings Tab. A video driver is the software that links the operating system to a particular mother board video circuit or display adapter (video card). To troubleshoot the video driver, first locate the video circuit in Device Manager. 2. In Control Panel, double-click on the System icon to open the System Properties dialog box. 3. 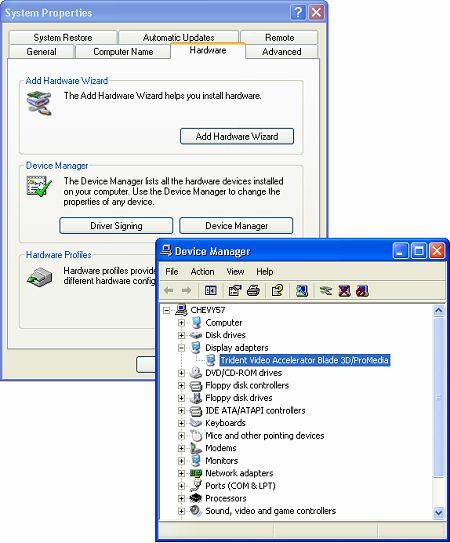 In the System Properties dialog box, select the Hardware tab and on the Hardware page, click on the Device Manager button to open the Device Manager dialog box.